Welcome to the Danber Music Store featuring editions of unusual or unknown piano music. 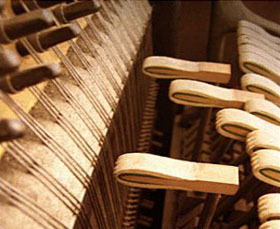 This company’s catalog was started with Daniel Berman’s own arrangement of the Brahms Haydn Variations for piano solo. The intention was to add a major concert work to the Brahms solo piano repertoire by rewriting the original two-piano version in a version for one piano, reproducing the original as faithfully as possible while also giving the listener as much of an illusion of two pianos as two hands could provide. Requires virtuoso pianism. See artist’s performance in the video section on this website. I just listened to your one-piano version of Brahms Variations on a Theme by Haydn. I didn’t think it could be done well, but you did it. I know this piece very well, and so was able to tell where you had to fit it to two hands instead of four. But you did it well, I must say. I started playing this piece in college in 1975 or so, playing the second piano part for a senior. I had astronomical stage fright at the time, so it didn’t go so well. That was ages ago, so I am now OK. It is such a treat to be able to come to the public library here in Oak Park, and listen to music. I hope that you have gotten good reviews, and as soon as I am able, I will buy your version. It’s awfully hard to get a second piano to play two-piano music. I want to thank you for your terrific YouTube video, playing Bill Bolcom’s “Three Ghost Rags”. Your interpretation is, by far, the premier of all those recorded. How exciting ! No longer a professional musician by many years, I’ve recently stumbled upon ACMA, the Amateur Classical Musician’s Association, and performed (Gershwin & Nazareth) at Carnegie Hall’s “Passion Through Performance” Series last Saturday night. Right up my honky-tonk alley of the ’70’s, I now hope to dive into “Three Ghost .. ” for fun and non-profit. And in this, Daniel, in my wildest dreams, I hope to channel you ! What a talented musician you are … such style, such technique, such fun & such flair.